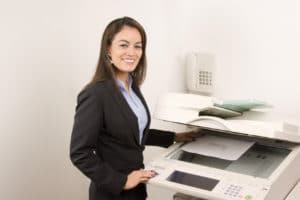 If you have been using the same copier for an extended period of time then you may run into something you have to deal with soon: having your copier discontinued. This can be a scary phone call to get from your leasing company. They may tell you that you need to get a new lease or think about upgrading your copier. However, using a discontinued copier doesn’t have to be scary. Discontinuing a copier simply means that the manufacturer will not be producing any more of that model down the road. Your leasing company may tell you that this means that you must upgrade because your copier will no longer be able to be maintained. However, there is something that they are not telling you. All discontinued copiers must have their parts available for at least 5 years after they are discontinued. This means that doing maintenance on your machine does not have to be difficult. You just need to check if your lease falls within that 5 year range. Add 5 years to when they discontinued your model. Not every copier salesperson is trying to scam you for money. Some of them actually have your best interests at heart, but it never hurts to double check on your own. Just remember that using a discontinued copier is no different than any other model as long as you are still able to get the parts that you need.